ANN ARBOR—In the 1960s animated sitcom The Jetsons, George Jetson commutes to work in his family-size flying car, which miraculously transforms into a briefcase at the end of the trip. The UM-Ford study, the first comprehensive sustainability assessment of VTOLs, looked at the energy use, greenhouse gas emissions and time savings of VTOLs compared to ground-based passenger cars. Although VTOLs produce zero emissions during flight, their batteries require electricity generated at power plants. Akshat Kasliwal, first author of the study and a graduate student at the UM School for Environment and Sustainability, said the findings can help guide the sustainable deployment of an emerging mobility system prior to its commercialization. 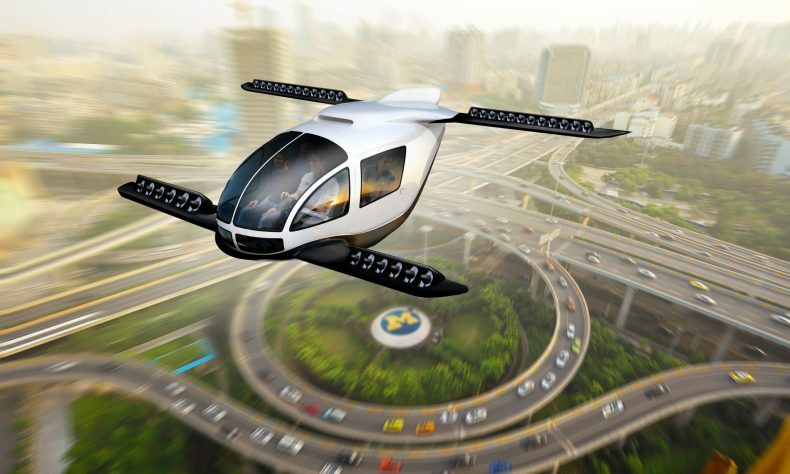 Several aerospace corporations and startup companies—Airbus, Boeing, Joby Aviation and Lilium, for example—and agencies such as NASA have developed VTOL prototypes. One critical efficiency enabler for these aircraft is distributed electric propulsion, or DEP, which involves the use of several small, electrically driven propulsors. The UM and Ford researchers used publicly available information from these sources and others to create a physics-based model that computes energy use and greenhouse gas emissions for electric VTOLs. “Our model represents general trends in the VTOL space and uses parameters from multiple studies and aircraft designs to specify weight, lift-to-drag ratio and battery-specific energy,” said Noah Furbush, study co-author and a master’s student at the UM College of Engineering. But for shorter trips—anything less than 35 kilometers (22 miles)—single-occupant internal-combustion-engine vehicles used less energy and produced fewer greenhouse gas emissions than single-occupant VTOLs. That’s an important consideration because the average ground-based vehicle commute is only about 17 kilometers (11 miles). Other authors of the Nature Communications paper are from Ford’s Research and Innovation Center in Dearborn: James McBride, Timothy Wallington, Robert De Kleine and Hyung Chul Kim. The Nature Communications paper is titled “Role of flying cars in sustainable mobility,” DOI: 10.1038/s41467-019-09426-0, is available at www.nature.com/articles/s41467-019-09426-0. This story was published by Technology Century.